In 1973, the combined bands of the Grenadier and Coldstream Guards played the European anthem, Wembley switched on new and improved floodlights and Bobby Charlton made his final appearance at the famous old stadium in a special football match to celebrate Great Britain’s entry into the "Common Market" known more formally as the European Economic Community (EEC). There was even an Irish backstop, goalkeeper Pat Jennings. The match was part of a celebration called "Fanfare for Europe". This included concerts, exhibitions of art and also sporting events. Among the artistes appearing were Lord Olivier, Herbert Von Karajan, Kyrie Te Kanawa and Judi Dench. British Prime Minister Edward Heath enjoyed conducting classical music and his sport of choice was yachting, but British Government officials were also keen to put on events for "’the young and those who are not accustomed to putting on either white or black ties". It fell to Lord Goodman, former Chairman of the Arts Council, and Lord Mancroft to coordinate "Fanfare for Europe". Their committees began work in 1971. Football, "all in" professional wrestling and even a beauty contest made it onto the fixture list. Professional wrestling was shown regularly on Independent Television in Britain in the 1970s. ITV Sport’s Gerry Loftus reported that "’Joint Promotions’" in Leeds were promoting an EEC-flavoured wrestling bill and requested £350 in expenses "in order to bring special wrestlers from the European countries". The competition was televised that Saturday in World of Sport. There was a vintage car run from London to Brussels, weightlifting in Glasgow and volleyball, fencing , basketball and judo in Edinburgh and gymnastics, badminton and trampolining in Cardiff. A rugby union match between Wales and the Rest of Europe failed to materialise but rugby in Wales did help celebrate the fanfare with a more modest tour by the Toulouse University XV . The centrepiece of the whole sporting programme was the football match at Wembley. It was arranged with the help of the Football Association. 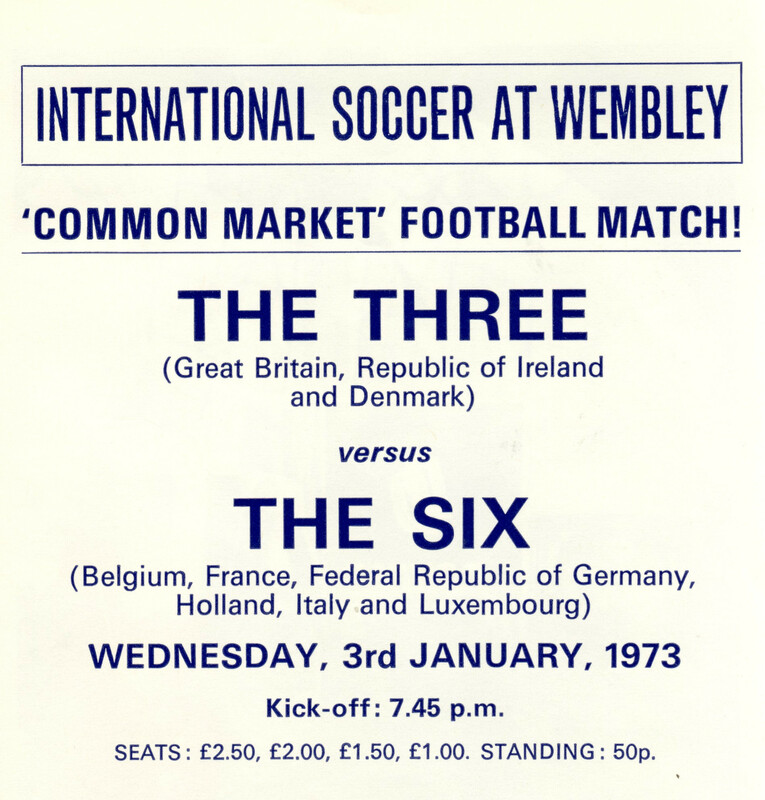 Originally listed in the Government planning documents as "New Community v Old Community", the match was eventually billed as "The Three v The Six". "I would have thought that if there is a suitable football match arranged,it might be a good idea for you to go," Government advisor Alan Simcock told the Prime Minister but added, "I would hope that you can avoid attending any beauty contests." 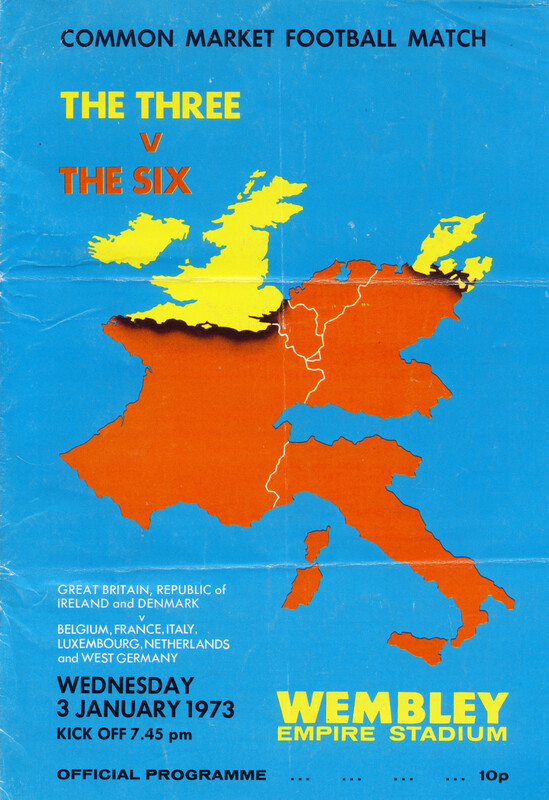 The Republic of Ireland and Denmark also joined the EEC on January 1 in 1973. They helped make up "The Three"’. The side was chosen by England manager Sir Alf Ramsey, who named an initial squad of 16. "To pick a team representing several countries is terribly difficult and I don’t think it would like to do it often." he admitted. Bobby Moore, Alan Ball and Bobby Charlton had all played their part England’s World Cup winning team at the same Wembley Stadium in 1966. Leeds United’s Welsh International goalkeeper Gary Sprake was chosen alongside club mates Billy Bremner and Peter Lorimer, both Scotland internationals, and the Republic of Ireland’s Johnny Giles. Ramsey also selected Northern Ireland’s Arsenal defender Pat Rice and Ipswich Town centre-half Allan Hunter. The official media bulletin managed to misspell Liverpool’s Republic of Ireland International Steve Heighway as "Highway". Ultimately,he did not play at Wembley because of "stomach trouble". Denmark’s Henning Jensen and John Steen Olsen, better known as the man who discovered Zlatan Ibrahimovic, were also included. Significantly, both men were already playing club football outside their home country, a sign of things to come in the not too distant future. West German boss Helmut Schoen had been put in charge of the "Six". The foundations of his squad were members of his 1972 European Championship winning team. These included the highly influential Gunter Netzer, described in the football parlance of the time as a "midfield schemer"’. For Netzer in particular, Wembley held happy memories. He had played the game of his life when West Germany beat England the previous April. Schoen’s original picks also included Dutch superstar Johan Cruyff, Johan Neeskens and Ruud Krol, all members of an Ajax side which were then dominant in European club football. Italy’s star striker Luigi Riva and Belgian Paul Van Himst were also selected, from France came Marius Tresor. 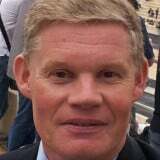 Louis Pilot from Luxembourg completed the representation of all six nations. "Providing Herr Schoen can persuade the rest of the team to fit in quickly and smoothly with the West German nucleus, Wembley’s customers should enjoy an exhibition of the attacking soccer rarely seen this side of the channel," suggested Donald Saunders in The Daily Telegraph. Although it represented an opportunity to see some of the best players in the world, ticket sales were slow even though prices started at only 50 pence. The most expensive ticket was £ 2.50. Organisers were faced with the embarrassment of a near empty Wembley Stadium. With less than a fortnight to go, only 14,000 tickets had been sold. "We are now very near the bottom of the barrel but I think I would have thought a few hundred more could be found for Wembley publicity," wrote John Morgan of the Foreign and Commonwealth Office. With less than ten days to go, Wembley’s press chief Len Went launched a last ditch advertising onslaught in the national and London press. A total of £500 was also be set aside for tickets for old age pensioners to attend the match. "It is hoped that this will attract a certain amount of favourable publicity to the event," wrote Morgan. Come the night itself, the crowd was larger than anticipated. Even so, the official attendance was still only 36,500, in a stadium with a capacity of 100,000. "Tonight’s match is unique in embracing the whole of the enlarged community," Heath wrote in his programme notes. "A major landmark in the history of European football." Heath was not at Wembley. The match clashed with the Fanfare for Europe gala at the Royal Opera House some 20 kilometres away in central London. As Premier, his place was there to welcome the Queen. Both teams and referee Norman Burtenshaw were instead presented to the Duke of Kent, President of the Football Association. Each was also given the special commemorative Fanfare for Europe tie as a memento. The band played a carefully chosen programme. There was the Entry March by Strauss, another march called Copenhagen and selections from Offenbach’s ballet Parisienne. Cruyff and Bremner, suffering from influenza had pulled out, but there was still plenty of talent on show. Goalkeeper Sprake also withdrew which meant a late call up for Jennings . He had not been considered for the original squad because of uncertainty over League Cup tie commitments with his club Tottenham Hotspur. Now that Spurs had safely reached the Football League Cup final, Jennings was free to play. Now he became an Irish backstop in more ways than one and kept a clean sheet for "The Three". There was no score in the first-half, but Italy’s Dino Zoff replaced Piot in goal for "The Six" at half-time and was soon picking the ball out of the net. A pinpoint cross from Charlton picked out Jensen to score with a diving header. "The Three" added a second when Scottish striker Colin Stein scored from close range in his first international appearance since joining Coventry City from Rangers. The crowd had been willing Charlton to score. It was not to be, but his final Wembley appearance ended in a 2-0 victory. "I enjoyed it immensely," he said. "I found it easy. Don’t write me off yet. You are talking as though I have reached my pension." In fact, this was was his final season as a Manchester United player. At the time it was still unusual to see footballers from overseas in domestic action but change was coming. In the days before this match football bosses met in secret to discuss how the EEC would affect football. "Whether they like it or not, a revolution is on hand," predicted one expert. "The day will come when transfers will be able to go through without any restrictions," said another, anticipating the Bosman ruling in 1995. Players from Britain had already started a continental drift after Liverpool’s Kevin Keegan moved to Hamburg in 1977. The launch of the FA Premier League in 1992 saw an explosion of foreign traffic towards English clubs. In 2019 It seems unlikely that an exhibition match such as "The Three" against ‘"The Six" would have been even been entertained at this stage of the season,such would have been the concern about injuries to star players.